Sean Jones pondered the question for only a second. 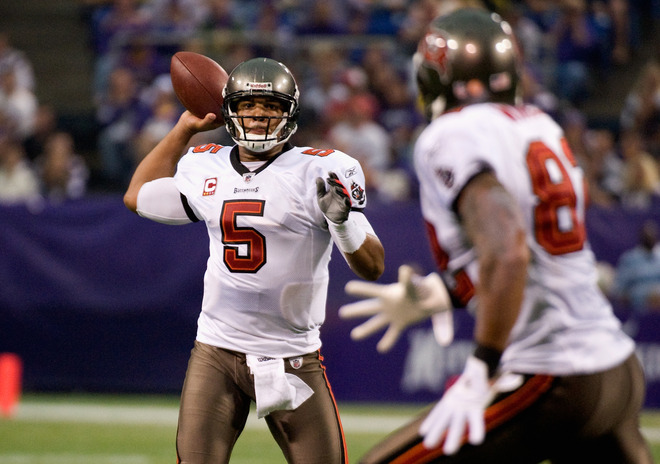 How tough must it be to face Bucs quarterback Josh Freeman? "I'm just glad he's on my team,'' the veteran said after Freeman rallied the Bucs to yet another comeback victory Sunday, 24-20 against the Vikings. Freeman has won 14 games since taking over as the Bucs' starter two seasons ago. More than half have been of the comeback variety, but this one, Morris said, may have been the biggest of all. "It's No. 1 right now, because it's the last one,'' Morris said. Freeman's latest victory kept the Bucs from falling to 0-2, something of a death knell in the NFL. A year ago, no team in the league that started out 0-2 reached the playoffs. Freeman's latest comeback was highlighted by a 15-for-20 second-half passing effort in which he threw for 191 yards and a touchdown. His only blemish in the second half was an interception in the end zone on a late throw off his back foot intended for tight end Kellen Winslow. Not even that derailed Freeman or the Bucs offense. It didn't alter anyone's confidence in the young quarterback, either. "We have the utmost confidence in Josh,'' left tackle Donald Penn.